Commemorated annually in Alberta, Métis Week remembers the efforts and execution of Louis Riel, while also celebrating the historical and contemporary achievements of Métis people working toward rights and recognition of their Nation. Many of the historical resources, sites and museums across Alberta contain Métis connections and stories. As the owners and managers of many of these sites, the Heritage Division strives to foster partnerships and collaborations with community to ensure that these stories are told accurately and respectfully. We also recognize how significant it is when these heritage places are owned and managed by Indigenous peoples and communities themselves. In honour of Métis Week, we are pleased to share the work of the team at Métis Crossing, who recently celebrated the ground-breaking at their new gathering centre, slated to open next fall. Métis Crossing is the first major Métis cultural interpretive centre in Alberta and began as a major initiative of the Métis Nation of Alberta. Their mission is to be a premiere center for Alberta Métis cultural interpretation, education, gatherings, and business development. The 512-acre site is designed to engage and excite visitors, and is comprised of river lot titles from the original Métis settlers who arrived in the late 1800’s. Their programming encourages active participation of visitors in activities that promote appreciation of Métis people, customs, and celebrations. Last year, our own Victoria Settlement Provincial Historic Site was pleased to partner with Métis Crossing to launch the Victoria Trail Voyageur Experience (recently renamed Paddle into the Past), an immersive tourism experience that tells the fur trade story along the North Saskatchewan River. Stay tuned to metiscrossing.org for updates to the summer 2019 schedule. The below article, titled “Breaking Ground: Construction begins on new cultural gathering site at Métis Crossing,” was written by Shani Gwin and appears in the Fall 2018 issue of Otipemisiwak, a magazine that is periodically published by the Métis Nation of Alberta. You can sign up to receive the electronic version of Otipemisiwak and other updates from the Métis Nation of Alberta here. 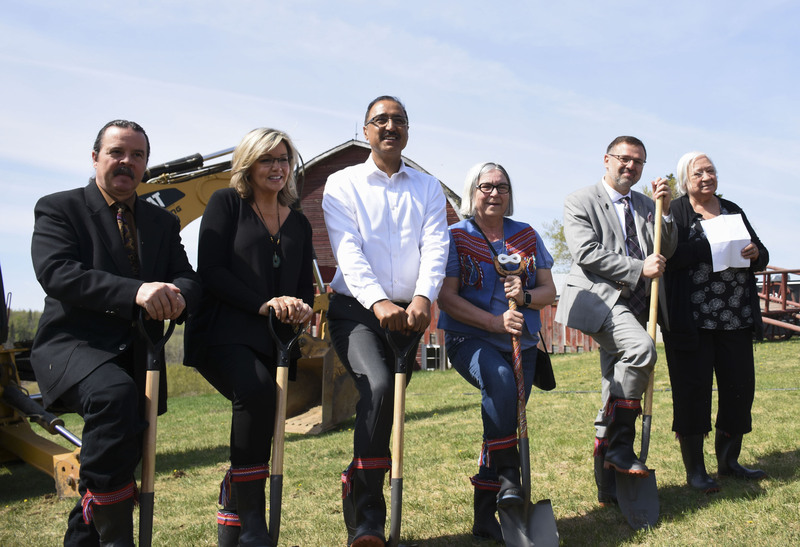 L-R: Smoky Lake County Reeve, Craig Lukinuk; Provincial Minister of Infrastructure, Sandra Jansen; Federal Minister of Infrastructure, Amarjeet Sohi; Métis Nation of Alberta President, Audrey Poitras; and Athabasca-Sturgeon-Redwater MLA Colin Piquette break ground at Métis Crossing, May 14, 2018. Image provided by Métis Nation of Alberta. Smiles, and even a few tears, filled the crowd at the official construction kick-off for the new Métis Crossing cultural gathering centre on May 14, 2018. The site was first purchased in 2001 with the help of Georges Brosseau, Orval Belcourt, and the late Herb Belcourt, co-founders of Canative Housing Corporation and the Belcourt Brousseau Métis Awards, with the promise that the site would always be for Métis people and to celebrate the successes and culture of the Métis. The new centre is scheduled to open in the fall of 2019, just in time for Métis Crossing to become a year-round attraction. Visitors will be able to explore the history of Métis people through programming and events throughout the summer, fall, winter, and spring. For many years, the Métis Nation of Alberta has dreamed of creating a place of pride where Métis people and visitors can share culture and tradition. For Métis Nation of Alberta President, Audrey Poitras, it was meaningful to see the dream come to life. The new centre will provide 10,000 square feet of gathering spaces, meeting rooms, classrooms, exhibits, and interpretive spaces to engage visitors. The centre is also designed to maximize energy and operational efficiencies to help Métis Crossing become financially independent. The Government of Canada committed $3.5 million for construction of the facility and the Government of Alberta also provided $1 million in funding for construction and site developments. 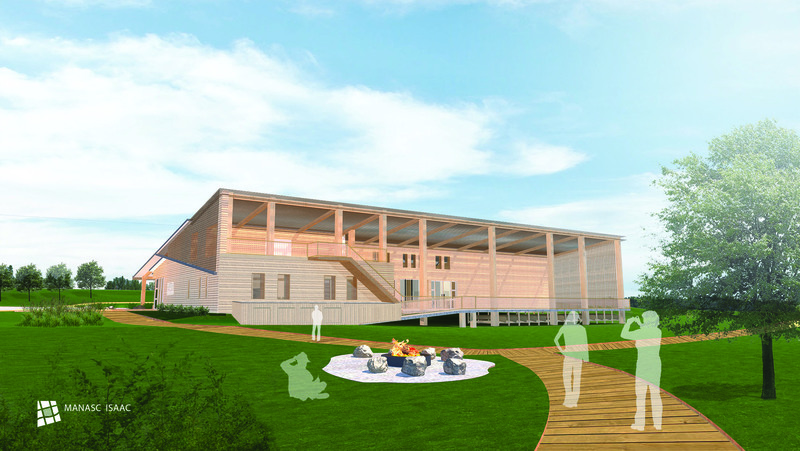 An architect’s rendering of Métis Crossing’s Cultural Gathering Centre due for completion in the fall of 2019. Image provided by Métis Nation of Alberta. Métis Crossing is located within the Victoria District National Historic Site, a beautiful 512-acre setting along the North Saskatchewan River comprised of five historic river lots. Just an hour-and-a-half northeast of Edmonton, it’s the perfect family weekend getaway with activities for all ages, hiking trails, campsites, and new comfort camping in Métis trappers’ tents. It is the first Métis cultural interpretive centre in Alberta and boasts a historical village, restored homesteads, nature trails, and Voyageur canoe trips. The development and operation of Métis Crossing mirrors the core values of the Métis community including self-sufficiency, respect of Elders, participation of youth, and pride in culture. This site is one of many initiatives and projects the Métis Nation of Alberta supports to develop the socio-economic and cultural well-being of Métis people in Alberta. Congratulations to the Métis Nation of Alberta and Métis Crossing for achieving this milestone. Mark your calendars for the reopening of Métis Crossing for the 2019 season on the May long weekend. For more information, visit metiscrossing.org or follow them on Facebook, Twitter and Instagram. A listing of Métis Week events can be found here. For more information, follow the Métis Nation of Alberta on Facebook, Twitter and Instagram, or sign up for their newsletter here. Title Image: Traditional trappers’ tents are part of Métis Crossing’s new summer camping options. Image provided by Métis Nation of Alberta.